This is the first in a series on climate change issues, especially as they relate to the Caribbean and the tropics. There is so much to say, to try to explain and to understand about climate change. But I agree with this recent observation by Barbara Walker, co-owner of Hotel Mockingbird Hill, a Jamaican eco-resort: “Climate change is the defining issue of the 21st century.” If we don’t face up to it, our survival on this Planet, even relatively short-term, is in doubt. I am not going to be alarmist, however. I plan to let you know about some developments in the region – and efforts to adapt to this reality. Because adapt we must. Change we must. And NOW. 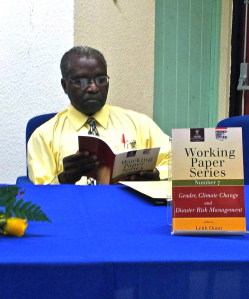 Deputy Principal of UWI Mona Campus Professor Ishenkumba Kahwa browses through the publication. ~ by Benji on August 4, 2014.